Hamas leaders of the Palestinian territory of Gaza are asking people to march along its border with Israel in the coming weeks. 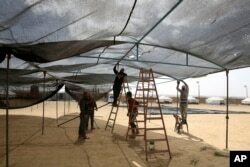 Hamas is seeking to gather large crowds to set up camps near the border beginning on Friday. It plans a number of demonstrations leading to a larger march to the border fence on May 15. That day marks the 70th anniversary of Israel’s establishment as an independent nation. Palestinians call it “the Nakba,” or catastrophe. Gaza’s leaders aim to gather hundreds of thousands of people for what organizers are calling the “Great Return March.” The group has not been able to get that many people to attend past demonstrations. But members of the Israeli government are still concerned. They have promised to react strongly if demonstrators cross the border. Hamas official Ismail Radwan said, “When we march to the border, the organizers will decide then what to do.” He warned Israel against harming the protesters. Hamas says the demonstration will center on the difficulty faced by hundreds of thousands of Gazans. They say they belong to families forced to flee their homes in what is now Israel, during the war that led to its creation. Hamas seized Gaza from the internationally supported Palestinian Authority in 2007. Conditions in the territory have worsened since then. Israel and Egypt blocked land, sea and air paths around Gaza when Hamas took power. Gaza and Israel have also fought three wars in that time. And last year, Palestinian President Mahmoud Abbas placed restrictions on Gaza to pressure Hamas into surrendering control of the area. All of these events have greatly damaged Gaza’s economy. Unemployment is well over 40 percent, there is no public, drinkable water and electricity is on for only a few hours a day. Egypt has tried to organize an agreement between Hamas and the Palestinian Authority. But, earlier this month, a bomb exploded near vehicles transporting Palestinian Authority officials into Gaza. The prime minister and security chief were among them but were not hurt. The Palestinian Authority blamed Hamas for the attack. Hamas blamed Israel. Mkhaimar Abusada is a political science professor at Gaza’s al-Azhar University. He said the Hamas leaders see themselves surrounded by opponents on three sides: Israel, Egypt and the Palestinian Authority. He said the protests are designed to move attention away from their problems at home while also troubling Israel without starting another war. “They think busying Israel with this issue may put it under pressure,” he added. Hamas’ popularity has greatly decreased over time. It is unclear whether the group will be able to gather the crowds it believes it can. Still, Gaze is a territory where there is little else for people to do with their free time. This, combined with social pressure could help bring in people. The demonstrations will begin after the Muslim midday prayer on Friday. Buses will carry people from all over Gaza to the five camps, situated several hundred meters from the border fence. Organizers say they are trying to make use of a Palestinian demand known as “right of return.” It demands that relatives of refugees who lost their homes in 1948 be able to regain their property. Israel opposes any large return of refugees, saying it would destroy the country’s Jewish character. Israeli Cabinet Minister Yoav Galant is a former general and member of Prime Minister Benjamin Netanyahu’s inner Security Cabinet. He said the military is well-prepared to prevent any border crossing. Violent incidents along the border have taken place every Friday since December 6. That is when President Donald Trump recognized disputed Jerusalem as Israel’s capital. He also announced plans to move the United States Embassy from Tel Aviv. Fares Akram reported this story for the Associated Press. Pete Musto adapted it for VOA Learning English. Caty Weaver was the editor. We want to hear from you. What do you think the result of the demonstrations will be? Write to us in the Comments Section or on our Facebook page.